Medina and Clyde Hill neighbors complain that noise from the new 520 bridge expansion joints is wrecking their lives and their sleep. WSDOT is investigating. An avid gardener, Gretchen Stengel typically spends hours out in her Medina yard with its sweeping view west to Lake Washington and the Olympic Mountains. 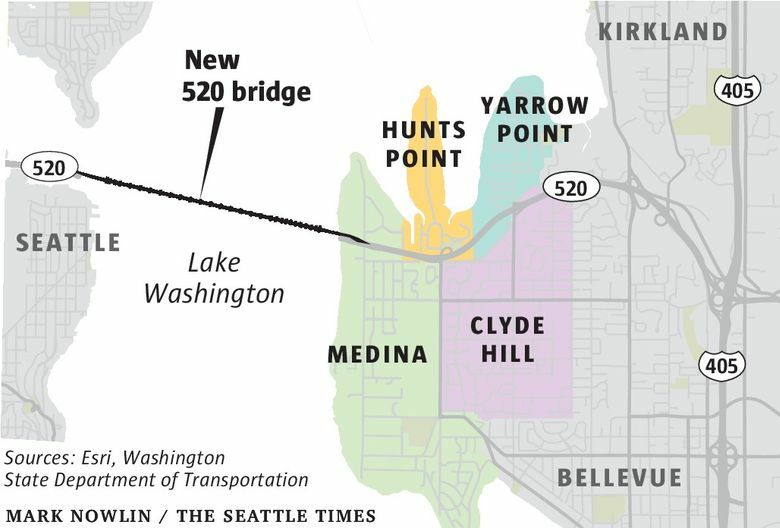 But since the new Highway 520 bridge opened in April, she said, the loud, intermittent thunk, thunk, thunk of cars driving over metal expansion joints has penetrated her house — even her sleep. More than 200 residents from Medina, Clyde Hill, Hunts Point and Yarrow Point on the Eastside, as well as homeowners across the lake in Seattle’s Laurelhurst and Madison Park neighborhoods, have registered noise complaints, according to Medina city officials and the Washington State Department of Transportation (WSDOT). At a cost of $4.6 billion from Interstate 405 to Interstate 5, the new 520 corridor is supposed to feature the latest in sound-muffling technology, from the grooved pavement that reduces the rushing noise of tires to the miles of noise walls between the freeway and residential neighborhoods. The state installed steel plating on the bridge’s underside to help contain the sound around the expansion joints. Within days of receiving the complaints, WSDOT dispatched crews to take sound measurements above and below the bridge, from the shoreline and at neighboring homes. State officials plan to report back to the Medina City Council at a June 13 meeting. 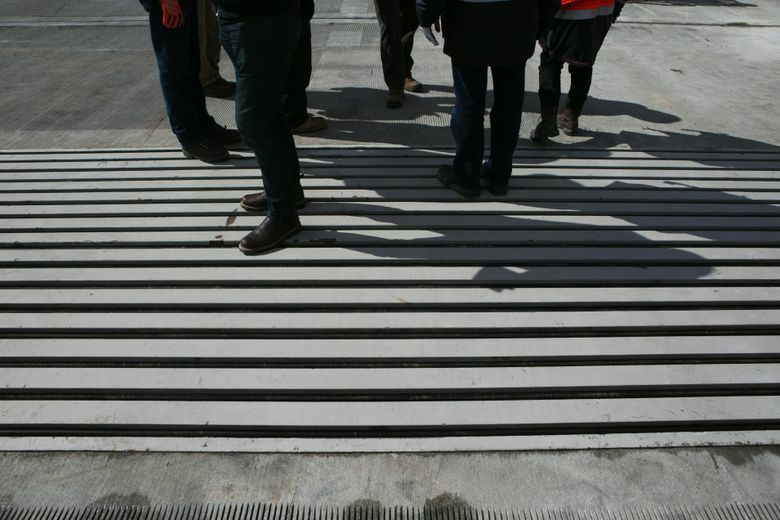 “There are no simple fixes for the sound generated by expansion joints, and WSDOT wants to make sure that we are thoughtful and creative in exploring ideas,” said Stacey Howery, with the 520 Bridge Replacement Program. Medina leaders remain concerned. They say the state’s measurements, released in an April 29 update, averaged the sound over a 15-minute period, which would not reflect the loudest thunks. He said the hills on either side of the eastern approach to the bridge seem to act as an amphitheater, projecting and amplifying the sound. He also speculated that reduced traffic noise from the grooved bridge deck makes the expansion joints seem much louder. Morcos said he hopes WSDOT returns both with measurements that better reflect the impacts on residents as well as possible interim steps to address the problem while permanent solutions are explored. Medina Deputy Mayor Sheree Wen downloaded an app with a sound meter and measured decibels — the relative loudness perceived by the human ear — at her home on Evergreen Point Road and at Evergreen Point Park, which overlooks 520. She said county and city ordinances specify a maximum decibel level of 55 during the day and 45 between 10 p.m. and 7 a.m.
Wen said her own readings found a peak of 93 on Saturday morning at 8:22 a.m. at her house and 98 at 8:36 a.m. at the park. “The new bridge has generated tremendous noise and disrupted residents’ daily lives,” said Wen. She said property values likely will be affected if people can no longer enjoy being outside in their yards. WSDOT faced similar complaints about expansion-joint noise after the opening of the new Tacoma Narrows Bridge in 2007. To address that problem, WSDOT specialists worked with private industry to design concrete walls coated with a sound-absorbing material. The material also was applied to crash barriers on the bridge. A report, published in 2011, said the strategy successfully reduced low-frequency sounds — those that travel the farthest and are the most annoying to the public, according to the report’s executive summary. Encapsulating the expansion joints was an effort to address noise in the design of the 520 bridge, said Steve Peer, 520 Bridge Program spokesman. WSDOT said it will also consult with the expansion-joint manufacturer and compare the specifications with the actual performance on the bridge. 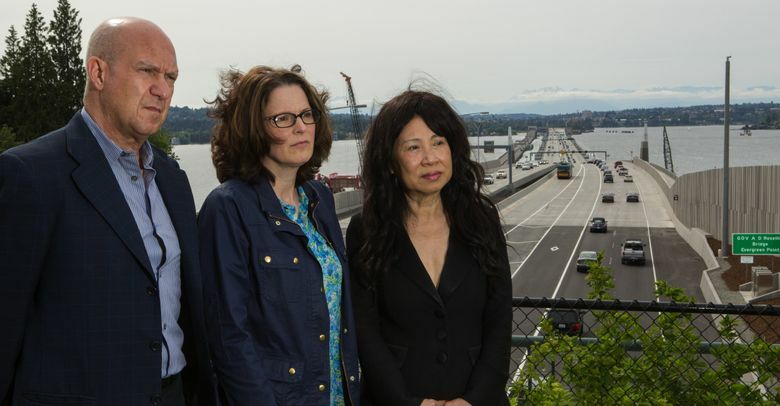 The 520 expansion joints allow the road deck to move and flex with changing traffic, weather and lake conditions, according to the April update. Unlike most joints, these also connect the fixed and moving portions of the bridge. There are two large expansion joints on each end of the bridge, one westbound and another eastbound. About a mile away from 520, at a home high on Clyde Hill looking northwest over the bridge and lake, Mary Magnano describes the noise as “a hammer hitting metal.” She also spends hours working in her beautifully landscaped yard. She said she used to hear the old bridge only at night, and only occasionally as a speeding motorcycle or large truck pierced the quiet. Now, Magnano says, she can hear the bam, bam, bam through closed, double-pane windows indoors.